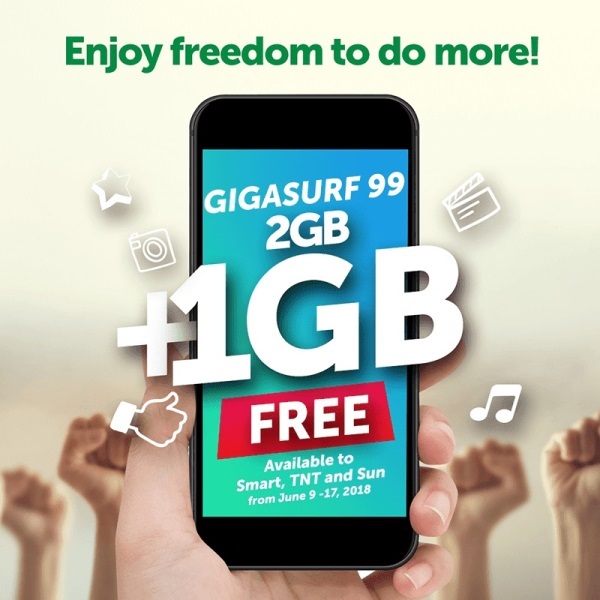 Smart Communications, Inc. has announced its promo for Smart, TNT, and SUN subscribers, wherein users will get an additional 1GB of data when they register to GIGASURF 99! Through the promo, users will now enjoy a 3GB of total data through GIGASURF 99. It also comes with unlimited texts to all networks valid for seven (7) days. To register, Smart users can simply send GIGA99 to 9999. Having the same keyword, TNT subscribers can text it to 4545 while SUN users can send it to 247. On top of its 3GB mobile data, subscribers can also get one (1) hour of YouTube access for free! The promo runs beginning June 9 to June 17, 2018.